We look at the pro’s and con’s of Logic Pro X and whether it is worth spending your hard earned coins on! Is Logic Pro X worth it? Yes, it’s only £199.99 which is very reasonable considering bundled extras – you can get a lot of mileage out of the program without purchasing additional plugins. Logic Pro has long been established as one of the go-to DAW’s in the industry, used by some of the world’s best producers and bedroom tinkerers alike. 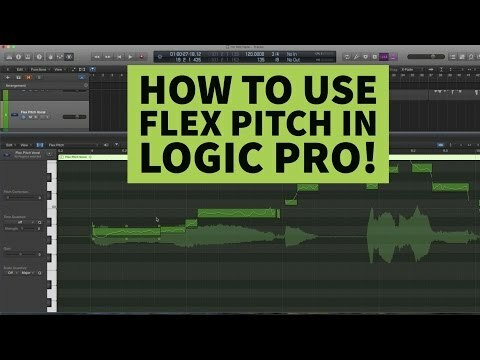 For songwriters, beat-makers and those looking to get some material recorded and produced with an array of high performance free FX and processors, Logic Pro X is worth it. Apple Logic Pro X was released 4 years after Pro 9 – users experienced a considerable amount of anxiety wondering whether Apple would break it or turn it into ‘Garageband Pro’. Well, it’s safe to say that neither of those prophecies were fulfilled, but have Apple sacrificed too much for the sake of usability and overall? 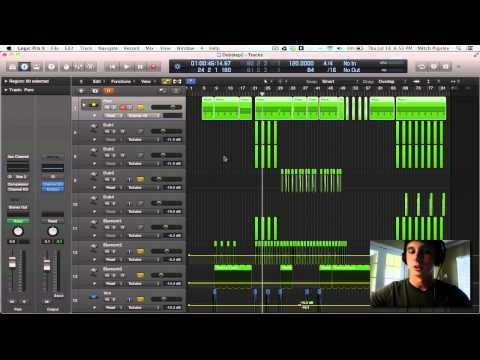 What are the pros and cons of Logic Pro X? Logic Pro X costs £199.99 from the App Store. Logic Pro X is not available under any sort of upgrade scheme – you have to pay the full price even if you’ve used Logic for decades. It’s obviously a Mac program and you purchase it via the iTunes App Store. It’s not too expensive considering you get lots of free instruments, notable favourites include ‘Alchemy’ and ‘ES2’, which are both synthesisers and ‘Space Designer’, an advanced reverb. There’s also heaps of EQs, compressors (including multiband), FX like phasers – all the usual stuff we’re used to getting from DAWs these days. The program itself is 650MB but there’s 2GB of essential files to download and another 32GB of stuff in the cloud if you so please. Loops, samples, patches, all in WAV ready to use..it’s a lot of free stuff and that certainly gives you some mileage for your money. Let’s start by saying that Logic X is undoubtedly designed for music creation ‘in the box’. 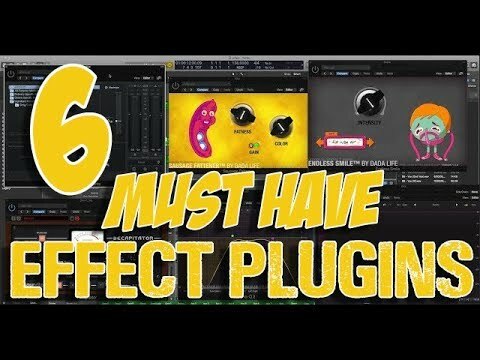 You can of course hook up microphones and other inputs if you have an interface just like you can with most DAWs but this isn’t where Logic X excels. Logic X is catering to the mobile producer who makes tunes on their Macbook, or the compact studio producer who mostly produces electronic music, or the singer songwriter which only requires a couple inputs. That’s not to say that Logic X isn’t able to meet demanding production situations – it’s just built and optimised with more modern digital studio production in mind. So is Logic Pro X worth it when it comes to the interface? Logic looks pretty different to how it’s ever looked before. It’s dark, very grey and very modern, similar to Final Cut Pro X which underwent a similar transition as Mac software. Still, you have to say that it looks good. The icons are fat and easy to use, the layout is crisp and sharp and it’s generally pretty harmonious to look at. Dim the studio lights and it looks even more classy. It has Apple sophistication for sure, but rest assured, it doesn’t look too much like Garageband! In terms of the UI, there’s tons of differences if you’re comparing to Logic 9. Firstly, the Arrange window is gone – replaced by the ‘main window’. The Arrange area is now the Tracks area, the Sample Editor is the now the Audio File Editor, and so on and so forth…Most of these changes are pretty simple or linear to follow for Logic Pro 9 or previous users. It’s more of a reshuffle than a redesign. GarageBand users will see the similarities too, which makes the transition relatively frictionless. It’s not so much that the programs function in the same way, it’s just that there’s harmony in looks and feel. Aside from renaming and re-shifting, the core functions do remain similar to older Logic programs, which is great if you’re a seasoned user. Sure, things have moved, e.g. the Transport is at the top now, and you will have to hunt for some of your go-to commands, etc, but nothing is hidden in silly or obscure locations. The Piano Roll has been updated with quantise settings and the Score Editor has been improved also, it’s easy to use and clearly labelled. One thing that has been inherited from GarageBand is that you can control volume and pan directly from the track list. If Apple do one thing right across their softwares then it’s creating an efficient workflow environment. Logic Pro X is no different, it’s definitely sleeker to use. Effects can be changed without the use of a modifier key, which makes complete sense (and always did). Plugins show useful information when you mouse hover, as do a whole host of other buttons and controls. Tabs and menus are easier to navigate – it’s difficult to put your finger on why the workflow is but it just is. Logic Pro X is packed with new features but they’re all integrated pretty seamlessly into the workflow. You can produce either with or without them – they’re there when you need them but they’re not essential. Most of Logic Pro X’s new features revolve around greater control and smoother workflow. Once again, these features are designed for the ‘in the box’ producer, as you’ll see from Logic X’s ‘Drum Designer’, one of its flagship features. We’ve all experienced a grossly disorganised and messy session. You just keep adding and adding until suddenly, everything is basically impossible to navigate. To assist, Logic Pro X allows you to stack tracks. You can create a sum of tracks which are joined to one main track, so say you have 5 piano variations, you can stick them all under one umbrella track. There are two types of stacks, Sum and Folder. Folder is more just for organising tracks but Sum allows you to control relative mix levels from your parent track. Logic Pro X might have semi-borrowed this from GarageBand which has a ‘kit designer’. It’s an awesomely powerful drum kit loop and groove tool which is fully customisable in almost every aspect from tone and timbre of the drums and cymbals to play style and other rather unique variables. 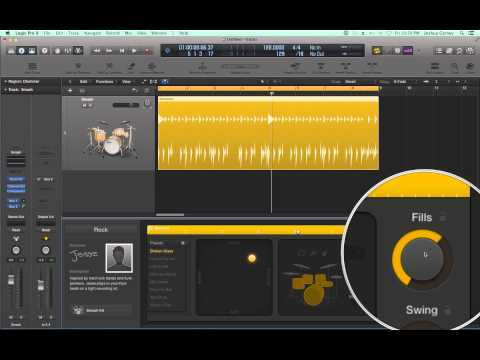 Logic X’s drum designer allows you to select from different styles of drummer and different sets of equipment. Logic says: “Drummer is powered by the performances and sounds of some of the industry’s top session players and recording engineers.” It’s very easy to use with its visually striking interface. Drum designer is capable of some great sounding tones and grooves which are pretty realistic, even if they are obviously very clean and professionally recorded. To me, this is a minor gripe. When you have a DIY vocal track, or live recording of guitar, bass or another instrument layered over what is clearly a pro recorded drum loop, it kind of detracts from the authenticity of the whole track. The Drum Designer gives you control over everything from volume and projection to groove but still, the end result is very high grade and clean – it’d be great if you could muddy it all up a bit to make it sound more authentic. One of Logic’s individualisms was the fact that its inbuilt instruments were quite dry. 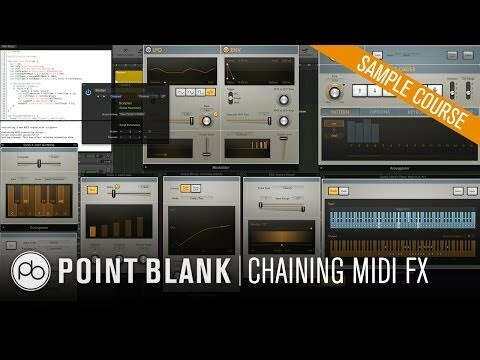 You’d then chain FX separate to the instrument itself, providing more choice and flexibility. The downside was that it was difficult to control the way FX interacted between the different FX without individually altering controls. Now, Logic allows you to control multiple variables easily from a Smart Controls panel which is automatically generated for each plugin on patch. This also works wonders for automation purposes. Smart Controls are one of these extra features that have been slid into the general workflow. They just sort of appear and tempt you to use them. It’s not vital to use them rigorously but they’re a great assistance when working with complex FX chains. This awesome new addition expands from Logic Pro 9’s Flex Time. It allows you to alter pitch with pinpoint accuracy whilst also displaying key information like deviation, vibrato and pitch movement. It’s thoroughly up to date and produces great results even on demanding sources. Logic Pro X adds to the newish Amp Designer with a Bass Amp designer. These Amp Designers have stompboxes, flangers, EQs, etc, and look great. In terms of synths, the Retro Synth is new for pretty standard analogue and FM synthesis. There’s updated organs and pianos too, nothing major but something nonetheless. Logic Pro X is of course compatible with most audio interfaces on the market. Be sure to check when purchasing to make sure. It is kind of typical of Apple to flagship one major feature in their software, in this case the drum designer. It is powerful though, you couldn’t say that it’s a gimmick. It’s capable of creating quality grooves and these aren’t just useful for singing over or similar, they’re great for producing electronic beats (with a good helping of FX and processing) and generally provide a quality solution to creating drum beats. In terms of UI and features, Logic Pro X is extremely solid. It doesn’t break new ground – it’s no DAW killer or world beater but it does what it does in smooth and sleek style, and that’s the Apple software way. I have personally used Logic for years and would not change my DAW, most wouldn’t if they are used to it. So is Logic Pro X Worth it? I’d have to say yes.